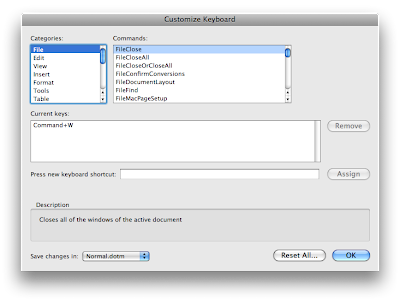 A New Mac Tip Every Day: Creating a keyboard shortcut in Word! I have this thing when I reread a text for correction that I change the font color to red when I want to add something and blue when I want to remove it. Doing this by going to the toolbox with the mouse takes just way too much time. I looked for a way to add a keyboard shortcut in the past, but didn't succeed because the feature is not part of any menu. It is however possible to do so. To assign the shortcut, go to "Tools" and choose "Customize Keyboard...". From there, you can assign a keyboard shortcut to anything you can do in Word. It will also warn you if the keyboard shortcut you are about to assign is already in use by another feature. Finally! i can make a short cut for sub- and superscript that i can remember! WOOOHOO! Is there something similar for Pages ...? There is a much easier and at the same time much more powerful way in Word to mark your changes with a color. Just select from the Tools menu: Tools > Track Changes >Highlight Changes… and Word will automatically color and annotate your additions and deletions. The power of this feature comes in when you work with several people on the same document: Word will pick different colors for different people and the chief editor can, using Tools > Track Changes > Accept or Reject Changes…, easily accept or reject individual changes or all changes at once. With a single click Word will either restore the original text or implement the change. Also if you work alone and want to tentatively make changes and later decide to keep or reject them this works perfectly. Another tip about Microsoft Word. If you want some fun, use Microsoft Word 2008 on a PowerMac G5 (I don't know if it works on the Intel Macs too). Word will play hide-and-seek with you. While you are typing, suddenly your window will disappear. Now where is it? Still in the same space, but hiding behind one of the other Windows? Or has it gone off to another space? Both is possible. The fun is, when you touch another Word window with the intention to move it a little to see what's behind, that window may disappear too. It is great fun. And sometimes Word plays being stubborn: you see your window, but when you click on it Word does not bring it to the front. The only request I would have to Microsoft is a way to switch this game off, because Word 2008 does this all the time on the PowerMac G5. Have fun! Exposé preferences with the new Exposé button! Shortcut to the enclosing folder!